I often ask the hubs if he feels like eating anything special and I will cook it for him. Last week, he ‘ordered’ Korean kimchi pancakes. Mmmm ok! I love crispy Korean pancakes too and am too cheap to buy it outside. I could have saved more if I made my own kimchi, but this time I simply bought ready made ones from the supermarket. I can make 3 pancakes with a 500g packet which cost about $7. So it’s still much cheaper to make it at home! This is a super easy dish to make – I like to use cake flour to make the pancake fluffier, and potato starch helps make it crispier in the hot oil. 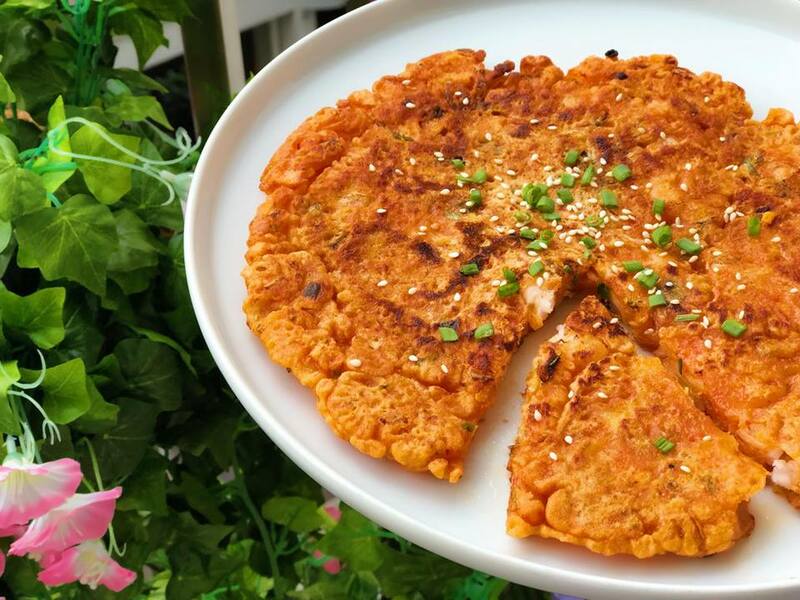 This batter is amazing… you can make different types of savoury pancakes with it simply by substituting the kimchi with something else. I have made ham and cheese, minced meat and spring onions, fish paste and prawns, and many more! The prawns are optional in this recipe, but they’re really good. So don’t omit them if you can! In a large bowl, combine cake flour, potato starch and salt and mix well. Add the chopped kimchi, prawns, spring onions stir with a pair of chopsticks. Add 2-3 tablespoons of water and combine everything together. If it’s tough to combine, add the remaining 2 tablespoons of water. The batter shouldn’t be dripping or runny. Heat up the oil in a 24cm round pan on medium flame. When the oil is hot, add the pancake batter and spread evenly til the batter covers the pan. Fry for 3-4 minutes till crispy. Flip and fry the other side till golden brown. Tip: Kimchi usually come in chunks/bigger pieces. I chop or snip them into smaller pieces as this helps the pancake stay in shape better.